Black Friday is a competitive time of year, but also one filled with abundant opportunity. As consumers prepare to snap up plenty of pre-festive bargains, the opportunity for brands to promote and sell their products is endless. Black Friday online sales for example have soared over the last few years, from 11.6 percent in 2016 to 24.1 percent in 2017. The opportunity for increasing sales is therefore very apparent for everyone involved in retail. But staying ahead of the game and standing out on the day itself all boils down to the retail basics. By creating a unique Customer Experience that stands out amongst the competition, brands will stay relevant to consumers even when up against the fierce competition. The art of this process is brand differentiation, something that Gartner has hailed as the ‘new battleground’ for retail. By generating a Customer Experience that is distinct, reliable, and unique on the day, retailers can unleash the keys to success. A good place to start is the reliability of the customer shopping experience. The principle challenge of Black Friday for e-retailers is to keep up with increased online traffic loads. Ecommerce websites often have to cope with millions of server requests during the day, putting pressure on them to keep their websites stable, operational and completely error-free. Retailers should therefore prepare for this by solidifying their technical infrastructures to cope with excessive demand. Brands should test all aspects of the online experience months before the event to ensure that it copes well under added pressure, from reviewing checkout pages and mobile page load times to monitoring the capacity of server bandwidths. By putting technical checks and tests in place, brands will ensure stability and resilience when customers are shopping their most. With no server downtimes or site crashes and errors, shoppers can purchase trouble free with a smile. One of the age-old challenges of retail is to balance consumer demand with brand supply, and this challenge is probably at its most profound during sales events like Black Friday, where consumer demand can be unpredictable. Merchandisers therefore need to plan their promotional stock accordingly to ensure that demand doesn’t outstrip supply on the day. Automated merchandising strategies are very useful in this process as algorithms can quickly replenish stock that will rapidly sell out, while also suggesting appropriate alternative products to the customer. Automated systems can also help customers to find the products that they want with ease by analysing popular search terms and automatically linking these to online product displays and recommendations. Such smart systems are especially valuable for big retailers with huge online product catalogues, as they can keep shopping pages tidy and in-stock throughout the day, while improving the customer’s on-site search experience in a precise and efficient way. While automated systems provide great value in delivering stability and efficiency during Black Friday, merchandisers should supplement these processes with their own creative observations. It can pay impressive dividends to use your creative eye to personally curate the customer shopping experience based on smart observations of what’s hot and what’s not on the day. Automated merchandising tools can be relied upon to do the heavy lifting in terms of category page replenishment, but merchandisers can make a big impact by looking out for products that are trending across social channels or in online media throughout the day to push these products to the front of their digital channels. By doing this, you not only engage the customer with amazing deals and products, but you also enhance your ability to sell products that are in demand and on trend. By making the process of shopping easy on Black Friday, you can generate impressive returns. On the day, shoppers will be engaged with a range of competitive online discounts, so by creating easily accessible discounted collections on your site, you can make Black Friday gift shopping easy, enjoyable and stress-free for your customers. A good way to go about this is to make sure you have all price-points covered, while showcasing these product edits across your channels. Also make discount shopping easy by speedily empowering visual searches, making sure that images are tagged with relevant attributes so that shoppers can find the hot products on your site without any trouble. Image search now accounts for over 25 percent of total organic searches, so pay it some special attention. Also look to optimising your key products for voice search too. Customers are increasingly searching with their voices these days as devices like Google Home and Alexa becoming more embedded into the shopping journey, so by making key products searchable via voice, you’re on to a Black Friday winner. 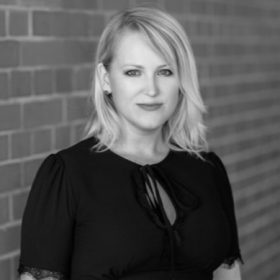 Katie Woodhead is Head of Business Consulting at ATTRAQT.